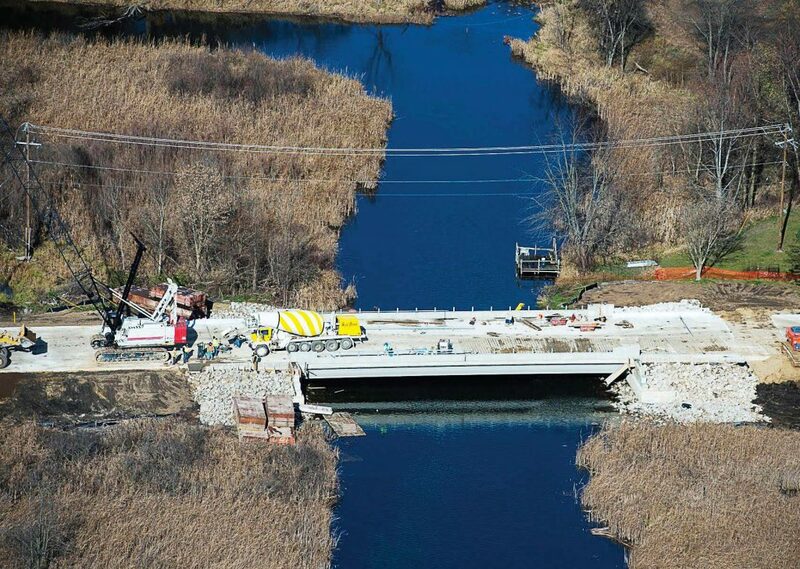 It’s never easy to let go of the past, much less embrace the future, but the Michigan Department of Transportation managed to span the divide and do both when it announced plans last year to replace the M-86 bridge over the Prairie River in St. Joseph County. The $4.9 million project, which began in July 2016, not only included plans to create a new and innovative structure, but also plans to relocate, restore and preserve the original one. Although historic records on the M-86 bridge are scarce, it is known that the 93-year-old camelback pony truss was originally built in 1923 on Telegraph Road over the Rogue River in Detroit. It was created to the same state standard as the bridge in New Boston with a main span of 90 feet and a roadway width of 27 feet. In 1938, the bridge was removed and rebuilt at the Prairie River site as part of the Public Works Administration’s response to the Great Depression. Contractor L.W. Lamb oversaw the project, which replaced a pinconnected, 82-foot “low type through truss span” with a 14.67 roadway width. The M-86 bridge is significant because it is the last remaining bridge of its kind on the State Trunkline Highway System and is eligible for the National Register. Due to its historic nature, MDOT is compelled to save it, however, the bridge is too narrow to handle the traffic volume along the M-86, and since 2013, MDOT has been looking to replace it. 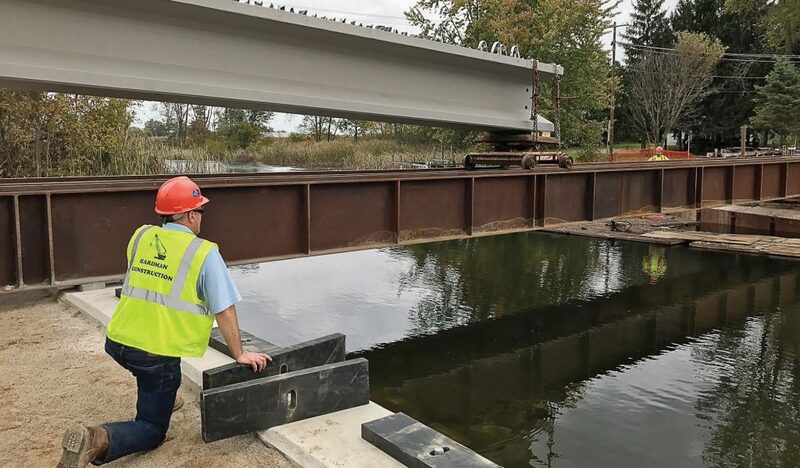 The new M-86 bridge is a state-of-the-art, 104-foot structure that is the first MDOT bridge to use carbon fiber composite strand reinforcement in the bulb T-beams. Carbon fiber strands provide many benefits to bridges as they are lightweight, non-corrosive and off er high tensile strength, which should extend the life of the bridge by 25 years or more. 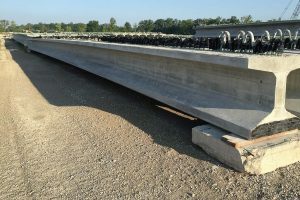 According to a MDOT press release, the concrete beams will be monitored in order to compare their longevity to beams that use traditional reinforcements on other new bridges constructed in the state. MDOT has been an innovator when it comes to utilizing carbon fiber reinforced polymers in its bridges. The first one to use this type of reinforcement was, appropriately, the Bridge Street Bridge in Kent County. Called “the bridge of the future” when it was constructed in 2003 by researchers at Lawrence Technical University, it replaced the traditional black steel reinforcement with a combination of stainless steel and carbon fiber materials. This latest design further reduces cracking and other deterioration by optimizing the post-tensioning process and replacing post-tensioning cables with these stronger, corrosion-resistant carbon fiber composite cables. From 2006 to 2008, researchers studied and tested these materials to find that transverse post-tensioning significantly improved the load distribution among side-by-side box beams and that increasing post-tensioning levels improved the overall behavior of the bridge model. The new M-86 bridge will also be one of only two bridges in the state to feature an innovative bulb T-beam that, when paired with the carbon fiber reinforcement, is expected to reduce concrete cracking, deterioration and corrosion that is typical in traditional steel reinforced bridges. With these new designs, MDOT expects the new beams will last far longer and will cost taxpayers a lot less in terms of maintenance. 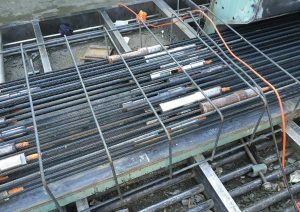 “We’re hoping that the use of carbon fi ber composite cables … could give us a bridge with a 100-year service life,” said Matt Chynoweth, MDOT project contact in the Bridge Field Services Division. For four months, traffic into Centreville was redirected as the old M-86 bridge came down and installation of the new bridge began. Th e project was only delayed by two weeks and met its budget. 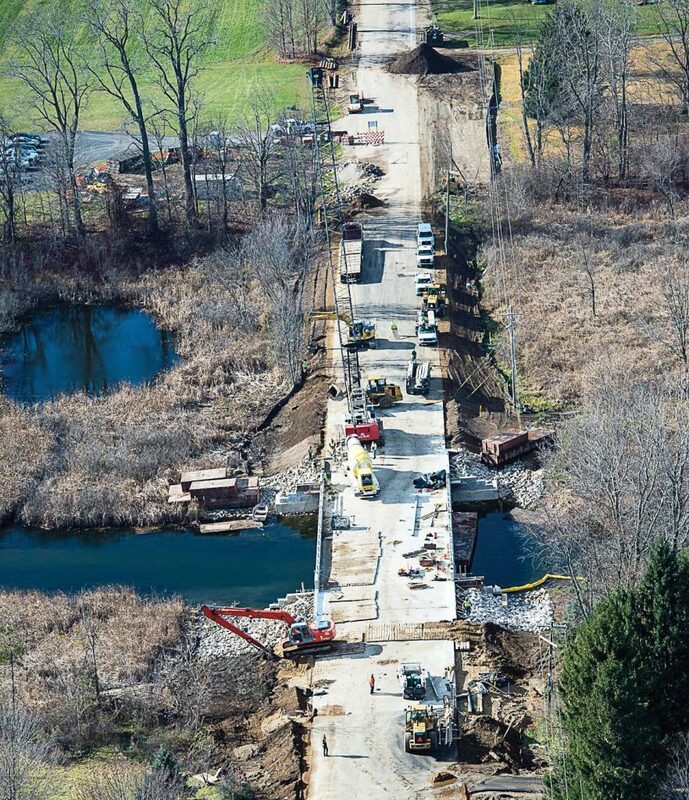 According to Nick Schirripa, in the MDOT communications office, there were some hydrology issues as the crews poured concrete into the water for the new bridge footings, but those issues were resolved quickly and the project moved along fairly smoothly. As for the old M-86 bridge, it will eventually be moved to Crystal Springs Road, which has a lower traffic volume and will make a more effective home for this versatile truss. Contractors will replace portions of the rusted steel and paint the entire structure before reinstalling it with more than 1,800 rivets. Schirippa said he is looking forward to the completion of the whole M-86 bridge project. “It is expected to be completed by September 2017,” he said.